One of the advantages to living in the greater Dallas-Fort Worth community is the abundance of resources, including those for new parents. Whether you are seeking childbirth classes like those offered by Natural Beginnings here in Richardson, or you are interested in prenatal workouts at Oh Baby! Fitness, you know that you can always find what you need. Sometimes, what new parents need is simply a little reassurance that everything is okay. This can certainly be the case when it comes to in-toeing and out-toeing. New parents typically expect their children’s limbs to line up in the proper fashion. This means “feet pointed forward” when a child starts standing and walking. In many cases, though, a young child will start his or her vertical experience with feet that point either inwards or outwards. As parents, you might be alarmed to see this, but it isn’t as uncommon as you might think. In-toeing tends to be more often seen and will generally not have long-term issues for the child. There are three different primary reasons why toes point in: metatarsus adductus (curved feet), tibial torsion (inward twisting of a shinbone), or femoral anteversion (inward twisting of a thighbone). In most cases, these three conditions will correct themselves over time. Previously, it was thought that special shoes or braces were needed, but study has shown that this is not true. If your child does toe in, however, it is still worth monitoring the condition. We will be glad to evaluate your son or daughter’s lower limbs to help with this for you. Out-toeing is less common, but can come with greater concern. There are definitely instances when this condition resolves itself over time and does not present long-term issues. Often, this occurs when the outward twisting happens to either the shin or thighbone. In rarer cases, out-toeing happens due to a neurological problem. 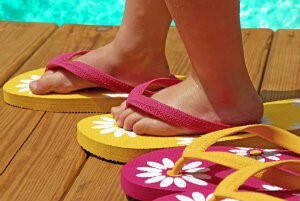 In-toeing and out-toeing issues range in severity and may or may not cause problems for your child. If you are concerned with your son or daughter’s gait pattern, bring him or her in for an appointment at Richardson Podiatry Associates and we will provide a professional evaluation and diagnosis. You will walk out with either the reassurance that there is nothing to worry about or a treatment plan to address the issue. For more information, give our Richardson, TX office a call at (972) 690-5374 or using our online form to request a visit today. You can find all sorts of information here on our website, but be sure to connect with us on social media if you’d like more tips and health news. We post, share, and tweet on Facebook, Google+, Pinterest, and Twitter.